Solar PV is now the third most important renewable energy source, after hydro and wind power, in terms of global installed capacity. Bringing together the expertise of international PV specialists Photovoltaic Solar Energy: From Fundamentals to Applications provides a comprehensive and up-to-date account of existing PV technologies in conjunction with an assessment of technological developments. Written by leading specialists active in concurrent developments in material sciences, solar cell research and application-driven R&D. Provides a basic knowledge base in light, photons and solar irradiance and basic functional principles of PV. Covers characterization techniques, economics and applications of PV such as silicon, thin-film and hybrid solar cells. 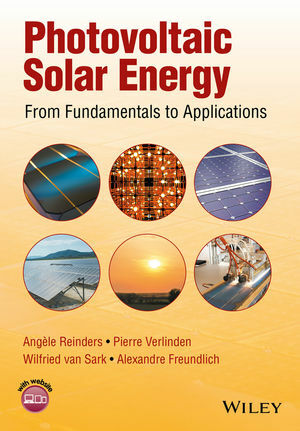 Presents a compendium of PV technologies including: crystalline silicon technologies; chalcogenide thin film solar cells; thin-film silicon based PV technologies; organic PV and III-Vs; PV concentrator technologies; space technologies and economics, life-cycle and user aspects of PV technologies. Each chapter presents basic principles and formulas as well as major technological developments in a contemporary context with a look at future developments in this rapidly changing field of science and engineering. Ideal for industrial engineers and scientists beginning careers in PV as well as graduate students undertaking PV research and high-level undergraduate students. Pierre Verlinden is Vice-President and Chief Scientist at Trina Solar , and adjunct professor at Sun-Yat sen University, Guangzhou, China. Wilfried van Sark is an associate professor at Utrecht University, The Netherlands. Alexandre Freundlich is a research professor of physics and electrical and computer engineering at the University of Houston.